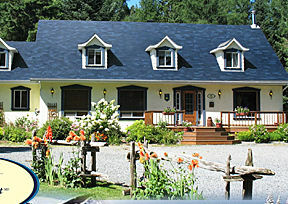 B&B in in Mt-Tremblant : Laurentians : Quebec : Canada : La Tremblante. Quality lodging at good prices. Everything you need in lodging and Bed and Breakfast. High quality lodging at low prices in b&b. Mont-Tremblant. Fill in this form or write directly to us at info@tremblante.com and it will be a pleasure for us to return you more information by email, standard mail or Fax. We can also take your reservation directly from this form: we will confirm your reservation and your payment. Do not send your credit card number through this form: we will take it over the phone or Fax. We accept only valid return addresses. Disclaimer: The information sent through this form will not be disclosed to anyone else. We will communicate with you for the procedure.